In his testimony, Mr. Greenspan again defended the Federal Reserve against criticism that it failed to crack down on subprime mortgages during his lengthy tenure, pointing out that the Fed warned about subprime lending and low-down-payment mortgages in 1999, and again in 2001. He also said the Fed warned about unfair or deceptive practices by state-chartered banks in 2004. ….Mr. Greenspan also said that while Congress gave the Fed the authority in 1994 to prohibit unfair, deceptive and abusive lending practices, lawmakers left those definitions murky. There was no “prevailing sentiment within the Federal Reserve — and it was certainly not my view — that entire categories of loan products should be prohibited as ‘unfair’ or ‘abusive,’ ” he said. So there you have it. Interest rates? Not the Fed’s fault. Deceptive lending practices? Not the Fed’s fault. Amazingly, the Fed was apparently completely powerless to do anything. To make a long story short, this is why I was so unhappy about the reappointment of Ben Bernanke to the Fed. 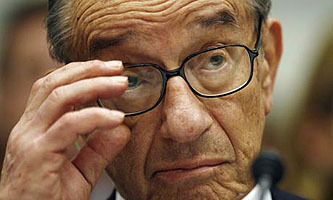 He may be a smart guy, but as near as I can tell he has nearly the same views as Greenspan. He just doesn’t believe that the Fed really ought to regulate any of this stuff. It’s also why putting the Consumer Finance Protection Agency inside the Fed is a bad idea. If your job is to regulate abusive lending practices, you really shouldn’t be housed within an agency that pretty obviously doesn’t care about that mission in the first place. Finally! Something that should make Kevin happy, right? Well, sort of. I certainly believe that stronger capital requirements and less regulator discretion are important, but it would be a mistake to think, as Greenspan apparently does, that we can just leave it at that. If Greenspan were genuinely in favor of substantially higher capital requirements (he declined to say just how high he thought they should be); genuinely in favor of narrower definitions of capital; genuinely in favor of applying this broadly to all sectors of the financial industry; and genuinely in favor of matching regulations to make this effective — then I’d say three cheers for Greenspan. As it is, though, he gets one cheer. A vague call for higher capital requirements is a step in the right direction, but it’s only a step.